Bowser signed the bill at the American Geophysical Union building, which is being renovated to achieve net zero energy. Image by AGU used with permission. 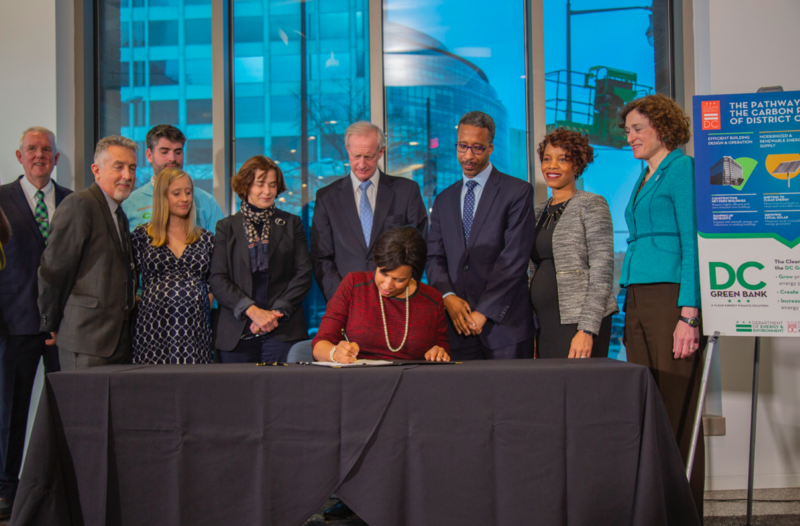 DC Mayor Muriel Bowser signed the most ambitious clean energy law in the nation on Friday. It requires all of DC’s electricity to come from renewable sources like wind and solar by 2032, 13 years earlier than California and Hawaii have committed to transition to 100% green electricity. The law also establishes new energy standards for existing buildings, increases fees on dirty energy like coal and gas and uses the money to fund clean energy programs, and sets ambitious new requirements for vehicle electrification. Councilmember Mary Cheh introduced the Clean Energy DC Omnibus Act in July. Substantial changes were made to the legislation in late November when it was approved by the Business and Economic Development Committee, chaired by Councilmember Kenyan McDuffie. The most significant change to the bill from McDuffie requires DC to substantially expand electric vehicle use. Under the law, public buses, taxis, and privately-owned vehicle fleets that carry more than 50 people must transition to zero-emission vehicles. Half of those vehicles will have to be electric by 2030, with the percentage increasing every five years until hitting 100% in 2045. It is unclear whether Metro, which is governed by the WMATA board, not the DC Council, will have to transition its buses to electric power. When asked, WMATA spokesperson Sherry Ly did not directly answer, but she wrote in an email that Metro plans to add electric buses to its fleet by the middle of the next decade and is studying an electric transition. Another gray area in the law: whether large private fleets that may not be based in the District but that operate in DC – like those of Megabus or FedEx, for instance – will be required to go electric. That question will likely depend on whether those vehicles meet the law’s definitions of being “licensed” or “certified” to operate in DC. 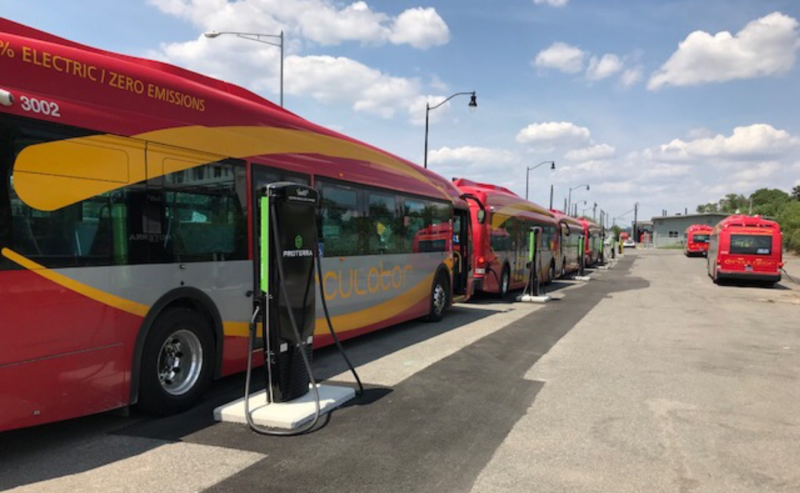 DC’s Circulator buses have already started to transition to electric power, and the law calls for the DC Department of Transportation and DC schools to stop buying non-electric buses by 2021. Circulator buses at an electric charging station. Image by Mario Sessions/DDOT used with permission. The law does not explicitly require other DC government vehicles to go electric, but one interpretation is that the electric vehicle requirement for light-duty fleets licensed to operate in DC would apply to DC-owned vehicles. Transportation accounts for 28% of greenhouse gas emissions nationwide, EPA numbers show. DC’s climate pollution from cars is lower than the national average because the region has strong public transit and DC has expanded pedestrian and bicyclist infrastructure in recent years. But transportation still accounts for 23% of carbon pollution in DC – the second largest source of emissions after buildings – according to DC’s Greenhouse Gas Inventories. Efficient approach to climate change? 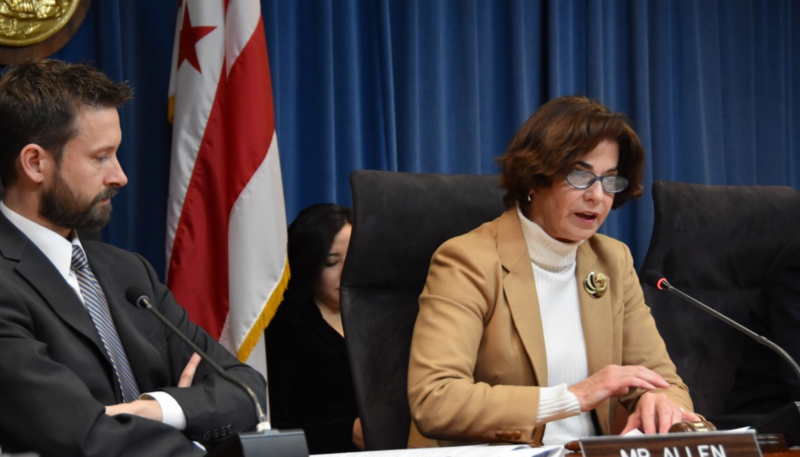 Another major change to the bill from McDuffie’s committee allowed Pepco, DC’s electric utility, to administer an energy efficiency program and charge customers for the cost, plus a guaranteed rate of return. Environmentalists worried that could undermine existing energy efficiency programs run by DC’s Sustainable Energy Utility. Another concern was that the language allowed Pepco to profit from executing a program merely trying to reduce energy use, not from actually reducing energy use. Most states with utility-run efficiency programs allow utilities to make money from the programs only if they achieve energy savings. Initially, the environmental community sought to have the Pepco energy efficiency provision removed from the bill. When that looked unlikely in the face of fierce lobbying from Pepco’s parent company Exelon, climate activists instead tried to improve the energy efficiency language added to the bill. The Sierra Club argued for setting binding targets for reduced energy use, with the electric utility financially rewarded for exceeding the targets and financially penalized for failing to meet the targets. The final language allows Pepco to charge its customers for energy efficiency programs “consistent with long-term and annual energy savings metrics, quantitative performance indicators, and cost-effective standards.” That means Pepco’s profits from energy efficiency are tied to performance. But the language is not as strong as the Sierra Club’s proposal, which was based on draft legislation from the American Council for an Energy-Efficient Economy. To allay concerns that an energy efficiency program from Pepco could undermine DC’s existing efforts, language was added stating that Pepco’s program cannot be “substantially similar” to those of the Sustainable Energy Utility. The DC Council debating the clean energy bill. Image by Chris Weiss used with permission. Environmentalists failed in their effort to restore a provision of the bill requiring DC’s electric utility to buy electricity through power purchase agreements, or long-term contracts for renewable energy. That measure was in the bill when it was introduced, and analysis of the legislation from DC’s Department of Energy and Environment found it would cut DC’s greenhouse gas emissions by 710,000 metric tons a year, or 8.1% of DC’s annual carbon pollution. Power purchase agreements for clean energy have lowered prices for consumers when implemented in other states, saving millions of dollars in Massachusetts and New Hampshire. But wind and solar energy compete with the fossil fuel and nuclear power plants of Exelon, Pepco’s parent company. Exelon lobbied to kill the power purchase agreements, even running misleading ads on Facebook, and the provision was removed. Environmental groups pushed to revive the long-term renewable energy contracts when the full council took up the bill. Several members of the DC Council supported an amendment from Councilmember Charles Allen to restore the provision, but Exelon successfully lobbied against it and lacking the votes to pass it, Allen did not offer the amendment. 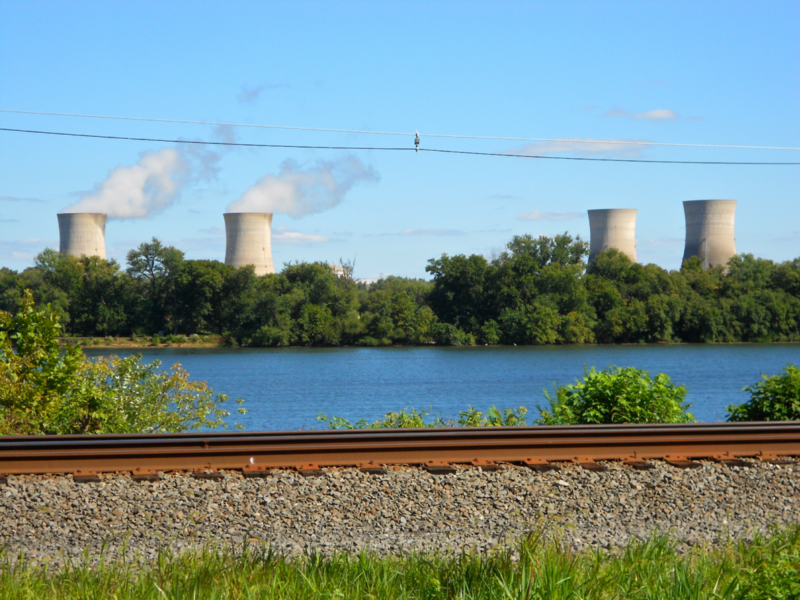 Three Mile Island Nuclear Plant by Smallbones licensed under Creative Commons. Nuclear power: the future or the past? Exelon, the largest operator of nuclear power plants in the country, lobbied the DC Council to include nuclear power in DC’s definition of “clean” energy. The environmental community opposed that, as did Cheh, who chairs the Transportation and Environment Committee. Nuclear power was not included in the bill. Though nuclear power does not involve combustion that releases heat-trapping gases into the atmosphere, tapping nuclear energy from existing plants does not reduce greenhouse gas emissions. These huge and expensive nuclear plants are in operation regardless of DC law. Redirecting existing nuclear electricity has no net impact on climate pollution. Additional demand for wind and solar energy will drive development of new wind and solar farms, which are relatively inexpensive. Nuclear plants, on the other hand, come with exorbitant price tags. A report from the Union of Concerned Scientists found that building a single nuclear reactor costs an average of $9 billion. Because of high costs, the last new nuclear power plant in the US entered service more than 20 years ago. For more than a decade, Georgia Power has been trying to build two new nuclear reactors, at a cost of $25 billion. The project is years behind schedule, billions over budget, and a “financial quagmire,” according to the Atlanta Journal-Constitution. Building new nuclear plants would reduce greenhouse gas emissions, but the steep price makes new reactors cost prohibitive. Some states, like Illinois, where Exelon is headquartered, subsidize their existing nuclear plants as zero emission sources of electricity. The cost, according to the Illinois Power Agency is $16.50 per megawatt of nuclear electricity. Wind and solar energy cost a fraction of that, averaging $2.89 for a megawatt of wind and $3.03 for a megawatt of solar in 2017, according to a renewable energy report from DC’s utility regulator. Subsidizing existing nuclear plants has no climate impact and is exceedingly expensive. But it boosts profits for nuclear companies, like Exelon, which is precisely why they support it. Councilmember Mary Cheh wrote the legislation. Councilmember Charles Allen tried to include long-term agreements for renewable energy. Image by Chris Weiss used with permission. Shortly after the Clean Energy DC Omnibus Act was introduced this summer, DC’s Department of Energy and Environment estimated the package would reduce DC’s greenhouse gas emissions by 49.4%. Almost a fifth of those carbon reductions were lost when Exelon killed power purchase agreements for clean energy. Final estimates on greenhouse gas reductions from the law have not been released. Regardless of the exact figures, the District’s clean energy law establishes DC as a leader on climate change. Let’s hope others follow DC’s lead. The author chairs the Sierra Club DC Chapter. If you are at the Ronald Reagan Washington National Airport Metrorail station and head inbound on the (full time) Yellow Line, what is the next station you will reach? Feel free to ignore station subtitles.